How can we live sustainably, buying locally, being mindful of our ecological footprint and still drink coffee? 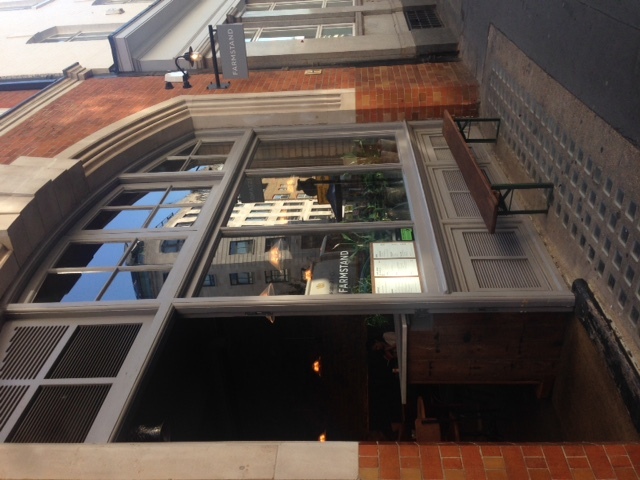 A recent trip to Farmstand on Drury Lane revealed a café conscious of its environmental responsibilities, somewhere that is trying to help us to make a difference while still enjoying good food and great coffee. Is it possible for us to have our coffee and drink it? The people behind Farmstand certainly seem to think so. The bare brick walls inside the spacious Farmstand have a certain rustic charm that serves to emphasise the environmental concerns of the café. A focus on local, free range meat and GM free vegetables means that this is definitely a place to be considered when looking for a lunch spot (though on this occasion, we only tried the coffee). Coffee is obviously not locally grown but is roasted by Workshop which is, relatively speaking, just down the road. Tea meanwhile comes from Postcard teas, just up the street. Water is complementary and is provided on tap so as to reduce plastic waste. The service was friendly and with such a bright and airy feel it is a very pleasant space to enjoy an Americano (though I imagine it is fairly crowded at lunchtimes). However, the Americano was served in a take-away cup (when I specified I was staying in). After a bit of digging on their website, I discovered that they use compostable and/or recyclable packaging sourced from London Bio Packaging. However, as it is not easy to either recycle nor to compost cups in regular waste collection (including recycling collections), it would be interesting to know details of how they dispose of their cups so as to know how they reconcile this with the otherwise careful environmental policy. As you enter the café, there is a staircase on the left hand side. 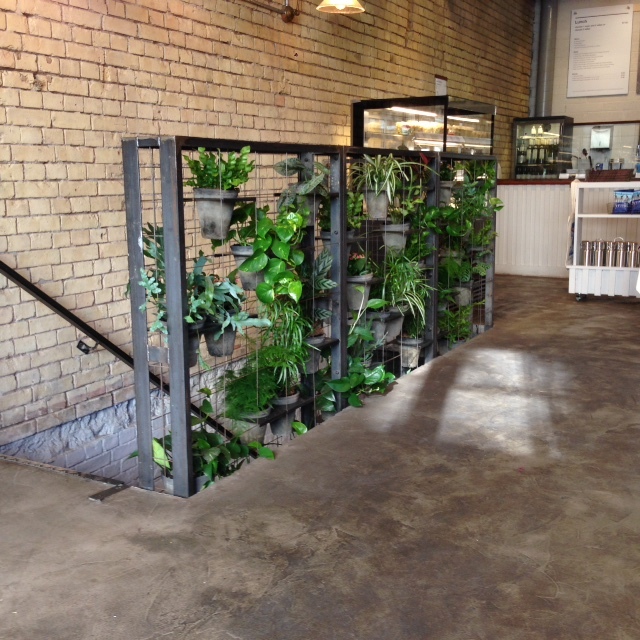 Potted plants are fixed to the railings making what seems to be almost a miniature green wall. A great way to get houseplants into a small space, this seemed a small scale example of the green walls that are starting to pop up around our cities. Green walls are vertical gardens. They can be grown either with climbing plants or with a second structure on the wall that supports the hundreds of plants. Along with an aesthetic appeal (certainly true of the structure at Farmstand), these green walls have environmental benefits too. A big environmental problem in cities is particulate pollution from exhausts. Specifically, particulate matter that is less than 10 μm diameter (think Turkish coffee grind) can irritate the lungs and cause health problems for the city’s inhabitants. Particulates less than 2.5 μm diameter are even more dangerous to health. Worldwide, in 2012, 3.7 million early deaths were associated with poor air quality. In London, a 2010 study showed that approximately 4000 deaths per year were the result of exhaust fumes. Which brings us to the first reason that green walls in cities may be such a good thing: Plants adsorb the pollutants. 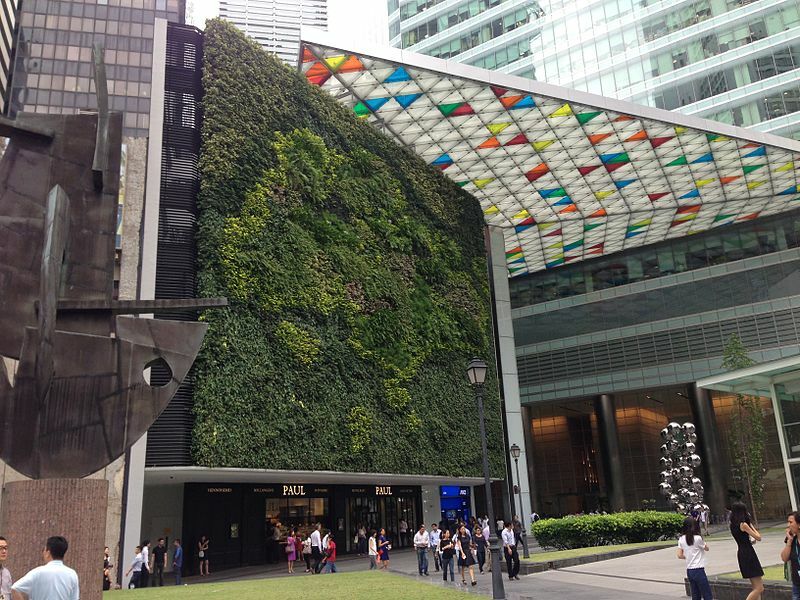 A green wall at the Ocean Financial Centre in Singapore, Image shared under cc license (attrib. share alike) by smuconlaw. Over a three month period, a study by Imperial College showed that a single green wall on Edgware Road tube station had removed 515 g of particulate matter from the atmosphere. Using a mix of plants on the wall was found to increase the air turbulence around the wall and so increase the adsorption of the pollutants. Of course, different plants performed differently (in terms of their ability to remove particulate matter from the air). One of the plants on the wall (Convolvulus cneorum) could take out up to 2.73±0.16 g/m² of particulate matter*. On the other hand, another plant on the wall (Hedera helix) took out much less, removing only 0.28±0.02 g/m². However, we know Hedera helix by another name: Ivy. And ivy plants can produce a lot of foliage per plant very quickly. Convolvulus cneorum on the other hand, is a small plant with small leaves. While its efficiency could be very high, the amount of pollution it can remove may not be as great as an ivy plant, purely as a consequence of its leaf size. Which brings us to questions of aesthetics and practicality. The wall at Edgware Road is planted with many different types of plant in order to produce an effect that reduces pollution while also being good to look at. Similar walls have sprouted up all over the world. However, for short term projects that require a large amount of foliage quickly, planting ivy can be a good option as a pollutant remover. Some of the temporary structures built along Park Lane for the Crossrail project are now covered with ivy. Although I had initially thought that this was due to a lack of weeding, it turns out that this is part of a step towards pollution reduction in our cities (modelling data has indicated that these green walls can reduce the local particulate pollution by 10-20% depending on the geometry of the wall and the plant species growing). A small step perhaps, but one that is definitely in the right direction. The green wall at Farmstand could therefore be said to illustrate the idea that if we are to make a difference to our external world, we must start by reforming our own interior one. We need to make green walls not green wash and we can start by paying attention to what we plant inside and out. *The study looked at particulate matter between 2.5 µm and 10µm diameter (i.e. PM(2.5)-PM(10)).